We ended up waking up pretty early since everyone in the shelter seemed to be packing up before 6 am! We got an early start at 7:05 and began our ten-mile trek town. The trail was very muddy this morning, but we did start out with a beautiful view of Stratton pond at the very beginning of our hike. We quickly did the 5 miles to the next shelter in less than 2 hours and the trail came out onto an old roadbed. Stratton Pond in the morning light. We walked the old and eroded road for about a mile before coming to Prospect Rock, where we were treated to an amazing view of the mountains and Manchester Center, our destination for today! The next few miles we were focused on getting to town and we definitely got there fast, rolling in before noon! We went to the post office and resupplied at Price Chopper since one of our meals got moldy in our box. We met an AT NoBo named Low Profile who was also staying at the hostel with us, so we had lunch together and got a ride up to Green Mountain House. 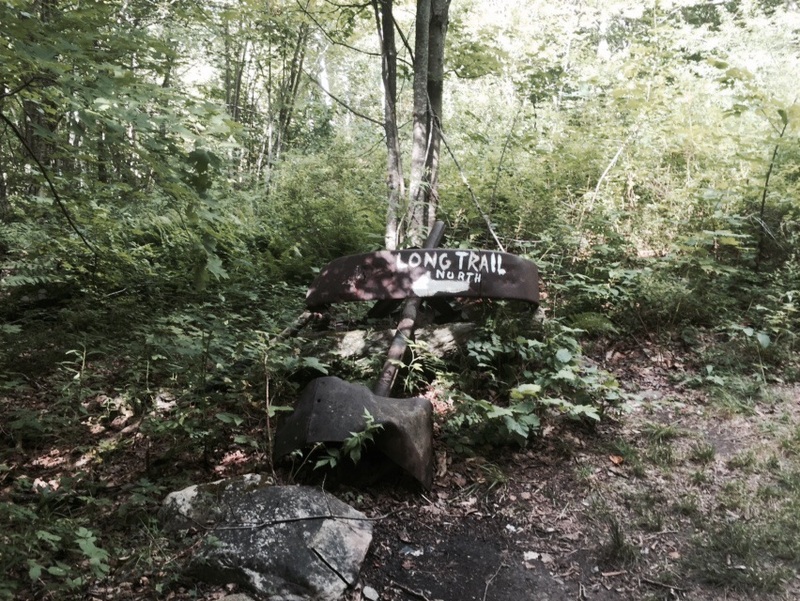 It actually says Long Trail, not Appalachian Trail! Jeff, the owner, picked us up and brought us to what can only be described as heaven on earth! This hostel is a house with a kitchen and private rooms. You get free laundry AND a pint of Ben and Jerry's with your stay! I went for the Half Baked. Our room even had a Finger Lakes Trail poster in it, so I think we were destined to stay here! Tonight Low Profile, NoKey, and I will be grilling steaks and asparagus for dinner... Can't wait! The view from Prospect Rock.